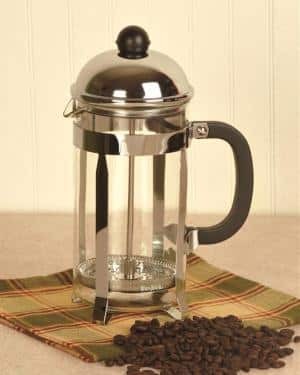 French Press Vs Drip Coffee: What’s The Difference? We’ve all had that moment, whether it was before a big interview, after a long a long night with a teething baby or hopping off a red eye flight, the moment of desperately reaching for cup of coffee. Sometimes every sip is like a hug for your tired body and mind, but other times it’s a bitter disappointment. There are many things to take into account from beans and roast to equipment and flavors. 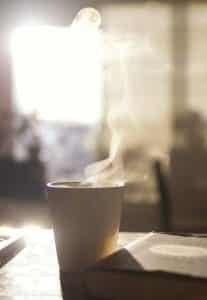 But the brewing method is the most pivotal part of the process of a great cup of Joe. Now, we realize that everyone is different. Our taste preferences, our schedules and our budget all affect how we handle our daily caffeine routine. 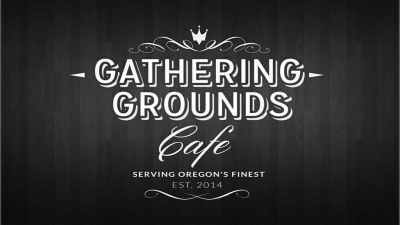 So, we at Gathering Grounds have put together a little how-to so that you can have the perfect cuppa every time. Before we get into that however it’s important that you are using great beans, fresh grind, and good equipment. We prefer using insulated french presses and SCAA certified coffee makers because they make better coffee than their cheaper counterparts. The insulated Espropress is probably the best french press around and when stacked up against the Technivorm Moccamaster then you’ve got a good competitive environment! Let’s talk about brewing with both the French Press and the drip coffee maker step by step, so you can choose what’s right for you. 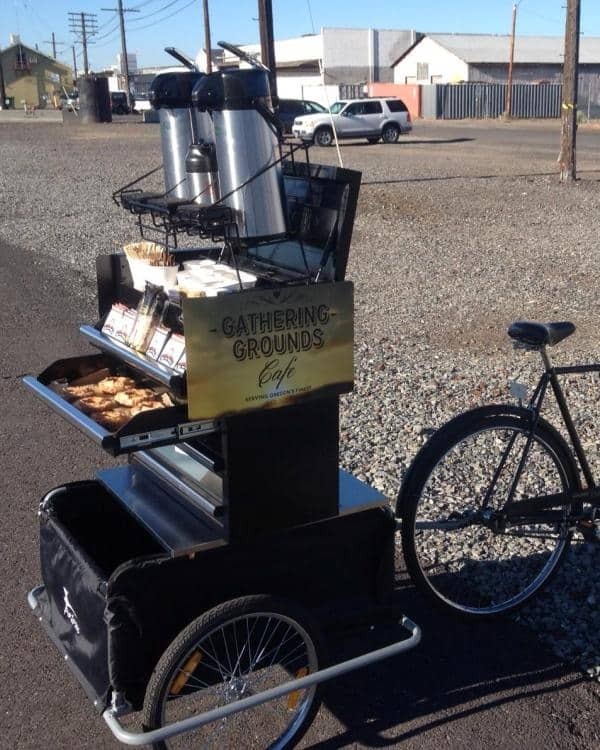 With this brewing system, you are engaged the entire process of your morning pick-me-up. Step 1: you put the water on. Whether you have a whistling tea pot or it’s modern counterpart, the electric kettle, do not let the water come to a boil. As we all know, the boiling point for water is 212° F, and that is simply too hot. Scalding water results in that bitter, sour taste we have all encountered. The National Coffee Association (NCA) has deemed 195-205 ° F the sweet spot for a flawless extraction of the flavour notes in your particular blend. While the water is warming, you can turn your attention to step 2: grinding and measuring the beans. Portland based coffee company, Stumptown Coffee Roasters, likens the perfect texture of coarsely ground coffee to that of bread crumbs. This is important because the coarseness of the bean will allow more of the oils to be extracted, which leads to the dark, rich taste that is associated with French pressed coffee. The NCA suggests that the perfect coffee to water ratio is 2 TBSP per 6 fl. oz. Obviously, the more you add, the stronger your press will be. Once your grounds are in the press, and your water is warmed, you’re ready for step 3: pour. There are two schools of thought when it comes to the proper way to brew a French press. One suggests that you must first fill the cylinder halfway. The prominent equipment supplier, Cliff and Pebble, tells us that this is an important step in the intensity of flavour. The other side suggests that allowing for a longer steep will do the trick. If you decide to go with the first method, you would follow step 4 and then fill the rest of the press before proceeding to step 5. “Breaking the crust” is barista speak for stirring the grounds that have floated to the top of the cylinder. This “breaking” is an essential part of the brewing process because it loosens the grounds so that the water will be better infused during the next step. Step 5: and we wait. 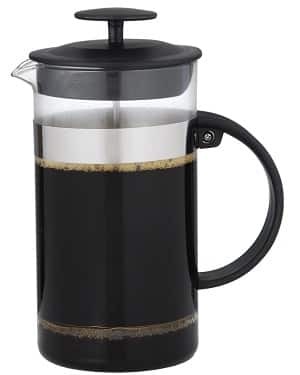 The NCA says that the brew time for a French press anywhere from 2-4 minutes. This time correlates with your preference to darker or lighter taste. The 6th and final step: put the press in French press. Bear down on the plunger at a slow and consistent pace. Then pour and enjoy the fruits of your labour. Coffee connoisseurs around the world favor this method because it requires intentionality. 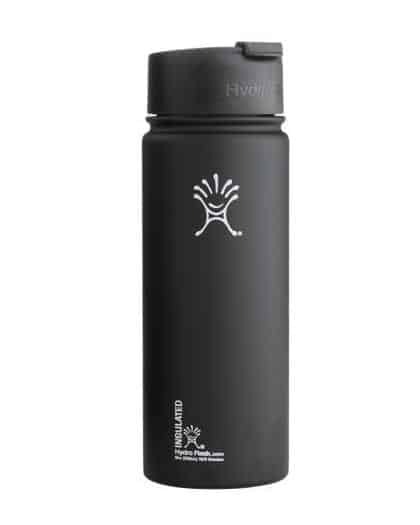 It creates a daily 5-7 minute ritual, on top of being easy to clean and store. If you are a fan of the French press you may also like the Chemex for a similar ritual in the morning but with a filtered taste. 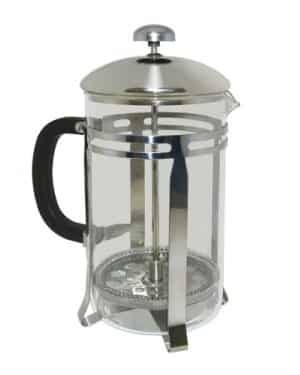 Here are a few of the best selling french presses today. Some are on here due to their low price so don’t expect them all to be literally “the best”. Let’s move on. What’s the drip on drip coffee? 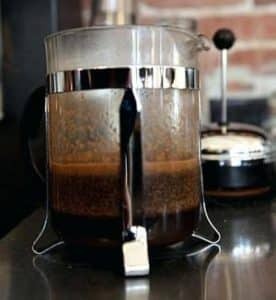 This is the most convenient way to make coffee, if you have the counter space to spare, and don’t have the time to give to a French press. If you were to walk down an the kitchen appliance aisle at any store, you would surely bump into an array of coffee machines ranging from single cup Keurigs to on demand coffee dispensers. The classic Mr. Coffee drip coffee maker is a perfect example of a standard drip coffee rig. Step 1: Fill reservior with water. Any coffee expert will warn you that it is absolutely imperative to use filtered water when you are making coffee in a machine. Tap water as too many minerals in it, and causes calcification/ build up, which will ruin the quality of brew you get in the end. On the other hand, using distilled water may cause your coffee to taste bland or flat. A simple Brita filter will make all the difference. We all have that one uncle who makes his coffee so strong, it looks like motor oil. In order to avoid that burnt taste and grimy mouth feel, you can follow the NCA’s suggested 2 TBSP to 6 fl. oz. rule. Lay your filter into the brew basket, and fill grounds evenly. If you have a Keurig this part is even easier. Just peel the sticker off the back of the pod, place that into the cup holder, and press the cup into the needle. Baristas in higher end coffee shops, will typically offer you a pour over, if you ask for a drip. Where the mechanics are essentially the same, with a pour over you can ensure that the water temperature to stay within that 195°F-205°F With a machine, you’re trusting the temperature gauge to be accurate. Step 4: let out your inner child and, push the button! It’s like magic; it really is. You can hop in the shower, finish an essay, or walk the dog and there will be coffee waiting for you. French pressed and drip coffee are very different. French presses yield a fuller flavor, because the oils have not been filtered out. But it takes longer. Drip coffee is easy and it’s consistent. But it usually yields lighter brews. If you like the unfiltered taste of the French press but don’t like the time involved then maybe look at the the Aeropress as an alternative. 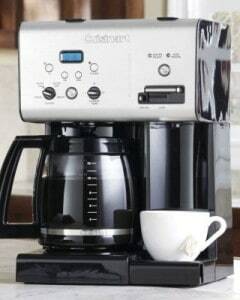 We have an assortment of coffee makers available here. We’d love to hear about your experiences with the different types in the reviews. Can You Boil Water With A Coffee Maker? Is There a Difference Between Aeropress and Stovetop Espresso Makers?